ELUSIVE CITY (USA) (Bay 2000-Stud 2004). Winner at 2, Deauville Prix Morny, Gr.1. Sire of 960 rnrs, 598 wnrs, 49 SW, inc. (Our) Vespa (ARC Diamond S., Gr.1), Xanadu, Famous Seamus, Elusive Wave, Perfect Fit, Jetset Lad, Kiram, Watch This Space, Atlantis Dream, Returntosender, Punta Stella, Shezhardtocatch, Adamantium, Soul City, Keep Quiet, Vedeux, Marvada, Ahdashim, Spalato, Luck of Smiling, Zylpha, Nashmiah, Bahana, River Bobo, etc. BAHANA (g. by Elusive City). 7 wins. See below. La Mouline (f. by Showcasing). Placed at 2 in 2015-16, 3d Taranaki 2YO Classic, Gr.3. Daponte (g. by Showcasing). Placed at 3 in 2015-16 in NZ. Forgotten Years. 4 wins to 1400m, A$134,370, to 2015-16, BRC Twilight Raceday H., 2d BRC Cascade H., SCTC Sea Vista Developments H., 3d ATC Cellarbrations H., Carlton House at Darley 4tracks4kids H., BRC Tony Stephens Air-Con H., Hamilton Hotel Jockeys Series H., James Boag's Premium H.
Touch of Glory. Winner at 1400m in Aust. Glitzabeel. 5 wins from 1400m to 2100m, 2d ARC South Auckland Racing Club Cup, 3d ARC Auckland Co-Op Taxis H.
Giho. 6 wins from 1400m to 1650m, A$75,915, WATC Go the Grey H., 3d WATC All New Tabform H., Communications Australia H.
Redevelop. 6 wins from 1550m to 3300m, A$131,790, 2d MRC (Mornington) Bayside Shopping Centre H.
PRECIOUS GLITTER (Danehill). 2 wins. See above. BEAUTY WATCH (Belong to Me). 6 wins-1 at 2-from 1000m to 1600m, A$636,175, Hawkesbury Gold Cup, Gr.3, AJC Legion Welter H., Hawkesbury RC Rowley Mile, AJC A Good Year H., Narellan Gardens 2YO H., Lanwades H., 2d AJC Flight S., Gr.1, STC Arrowfield Stud S., Gr.1, BTC Lord Mayor's Cup, Gr.3, NSW Tatt's RC Tattersall's Club Cup, L, AJC Hardy Amies H., STC Mad About the Hat Day H., 3d AJC Australian Oaks, Gr.1, STC Queen of the Turf S., Gr.1, BTC Rough Habit P., Gr.3, STC Civic S., L, Festival S., L, 4th AJC Razor Sharp H., L. Producer. Jobeth. 7 wins from 1500m to 2100m, A$185,610, WATC Westspeed 3YO H., Tabozbet.com.au H., Albany Cup, 2d WATC Robyn Piper-Macdonald H., Playeronline.com.au H., 3d WATC Carbine Club WA Apprentice Cup, Budget Truck Rental H., National Jockey Day H., Westspeed Stayers' H.
EMPIRE GOLD - PLASTIC POLYMER (H.K.) (Second Empire). 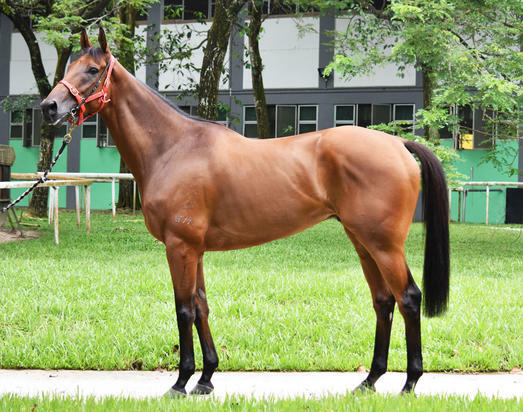 3 wins from 1600m to 2050m, A$77,600, HK$2,166,000, HKJC Centenary Vase, HK-3, 2d South Australian Derby, Gr.1, HKJC Yuen Long H.
Rush for Gold (Quack). 5 wins. See above. CAPTAIN TODD (Captain Rio). 7 wins from 1200m to 2000m, NZ$149,875, Timaru Cup, L, 2d South Canterbury RC Timaru Cup, L.
Race Record: 13 Starts 7-2-2 S$1,031,770. 7 wins from 1400m to 2200m, S$1,031,770, to 2016, Singapore Gold Cup, Sgp-1, Singapore TC El Dorado Classic, Sgp-3, Solutions S., Initiation P., Philanthropy S., Class 3 H., Class 4 H., 2d Singapore TC Class 4 H.-twice, 3d Singapore TC Captain Obvious S., Mr Big S.